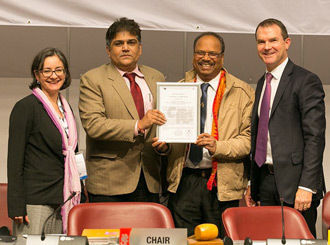 Consequently, the Secretariat decided to create Certificates of Commendation, to be awarded at the discretion of the Secretary-General, and announced their introduction with Notification to the Parties No. 2002/014 of 6 March 2002. CITES Secretary-General Mr John E. Scanlon presented the latest Certificates of Commendation to The Wildlife Crime Control Bureau (WCCB) of India. 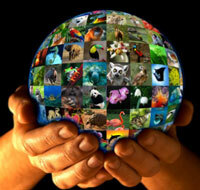 When the Secretariat receives such information, or when it learns independently of outstanding examples of enforcement-related work, it reviews the case to determine whether it can serve as an example to the wider law enforcement community or whether it has furthered the aims of the Convention in preventing illegal trade in wildlife in an innovative manner. Activities undertaken by individuals or organizations that significantly promote or contribute to the general enforcement of the Convention. The Secretariat is aware of other award schemes for wildlife law enforcement officials and the Certificates of Commendation are deliberately intended to stand alone and to be completely at the discretion of the Secretary-General. The Secretariat wishes to emphasize that it does not seek nominations for such awards but encourages Parties and other relevant organizations to continue to bring to its attention cases involving the combating or detection of illegal trade. The certificates are usually presented personally by the Secretary-General to the recipients. However, where this is not possible, they are presented by a senior member of the Secretariat, or may be presented to representatives of the recipient’s country. 2015 - The South African Police Service, National Prosecuting Authority of South Africa and Ezemvelo KwaZulu-Natal Wildlife were awarded Secretary-General's Certificates of Commendation for their exemplary collective activities during the undercover Operation Whisper that led to the arrest of members of crime syndicates involved in rhinoceros poaching and the illegal international trade in rhinoceros horn.